Thread: Welcome to Break it Down! Today I'm delighted to welcome you to Break it Down, a six week free class here at UKScrappers. Break It Down includes thirty-six steps or prompts along the way to six completed layouts within the class time, but you will of course be able to take those steps forward to use on as many projects as you would like in the future. For six weeks, we'll follow a format that breaks down one layout over the course of a week. You can actively work on your layout a little each day or you can think about it each day and save the actual scrapping for one scrapping session - whatever works best for you. On Mondays, we'll start with a story we want to tell. Each Monday prompt will feature a different way to start your page with photos or words and the memories you want to record in your albums. On Tuesdays, we'll talk colour and products. Each Tuesday prompt will showcase a different way to choose and use those elements that determine the final look of our page. On Wednesdays, we'll try Techniques. Have a look at six different techniques you can try and how you can adapt them to your stash of supplies and your personal style. On Thursdays, we'll decide the design. These prompts go back to core elements of solid graphic design that can be personalised in so many ways, so we can each follow the same principles yet have highly unique pages. On Fridays, we'll build and embellish. Try six different methods for the actual construction of a page and see which inspires you creatively. On Saturdays, we'll polish everything with some finishing touches. No room for anything lack-lustre: we'll make sure each of these six pages is treated to our full attention, and along the way we'll pick up some quick and easy ways to take a page from nice to wow. On Sundays, we take a day off! That might be your scrapping time, and it might be the time when you upload your page to share it with us in the gallery or chat to others taking part in Break it Down. As you can imagine, breaking each page into six different parts means each prompt is relatively short - that way you can do this is a few minutes, whenever those minutes might appear in your schedule. With six days to think about each page, it's perfect for telling the stories you've been meaning to include in your albums but couldn't quite figure out how to do them justice - because you'll have plenty of time to gather your thoughts throughout the week before the page is complete. This welcome thread to say hello and declare your intentions to join in the fun! A Q&A thread. If you have a specific question you would like me to answer, please post it on the Q&A thread, and I will do my best to answer it. A thread for each day's prompt. These threads will start with a note from me and that day's class prompt in PDF form. You can view it on screen or print it out - whatever you prefer. Then use that thread to discuss the prompt, how it's working for you, compare ideas with other UKS members, and share what you're making. 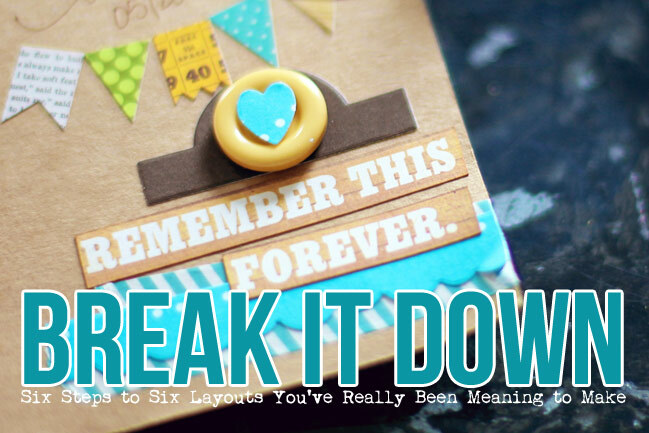 In the Gallery, you'll find a specific place to post your completed Break it Down layouts! We start today and run for the next six weeks. Everything will be posted here on UKScrappers, so you'll need to stop by to check in. I have a few surprises to share along the way, of course, so I'll be on the lookout for some UKS members who are really taking this project and running with it in their own way, or bringing a friend into the project, or just being a generally positive and helpful classmate! So what do you say? Care to join us? Woohoo!! Count me in Shimelle I get loads of inspiration from your classes. Can't wait to get started. Can't wait, need a scrapping boost! Sounds really exciting, and an ideal way for me to get more scrapbooking done in the spare moments whilst looking after my newborn baby (not to mention my 3yr old and 6yr old). This sounds like something I want to do. Really looking forward to this, love Shimelle's classes and always get lots from them. I'd like to try this ... and perhaps try a digi version too, if that is OK with Shimelle? Needing a push....but a bit time challenged - shall try and have a go! Sounds good, would love to join in.